"Unless you really know the lumber business through and through, I’d advise you not to go into the flooring business. The learning curve is too expensive. If you do, you have to like what you do. You’re like farmers or bakers. They rarely get rich. They do it because it’s labor of love and a love of hard work. I never went to college and this is all I know how to do. But I’ve really thought about it and I’ve tried to do it well. I love what I do and I’m going to miss it. It’s all I have ever known." "Anyone can run a machine. But can you take the best face off that board at the right thickness? That separates the men from the boys. You’re cutting into something you can’t see. You’re looking for clues like grain and a big, dark heart that means the tree has been struggling. 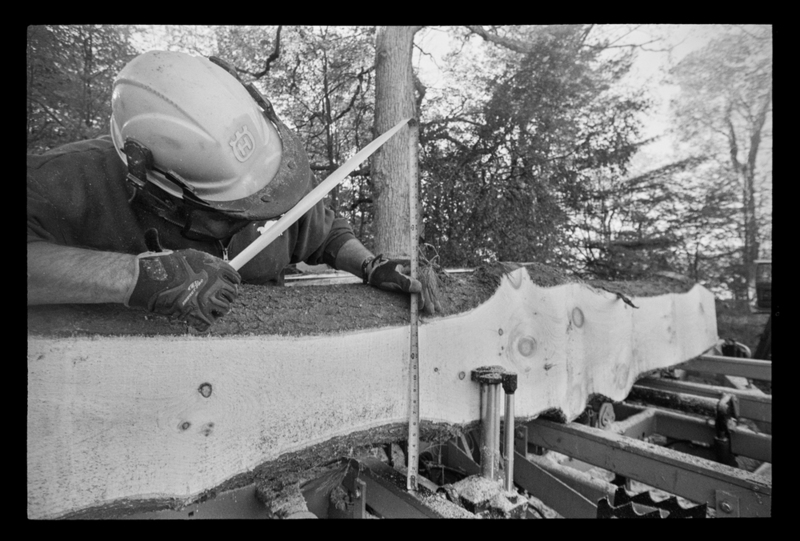 Some people never develop the sense that you’re not just sawing the outside of the log. You’re sawing what you believe is behind it. You’re sawing an unknown. I still get fooled and I’ve sawn millions of board feet." 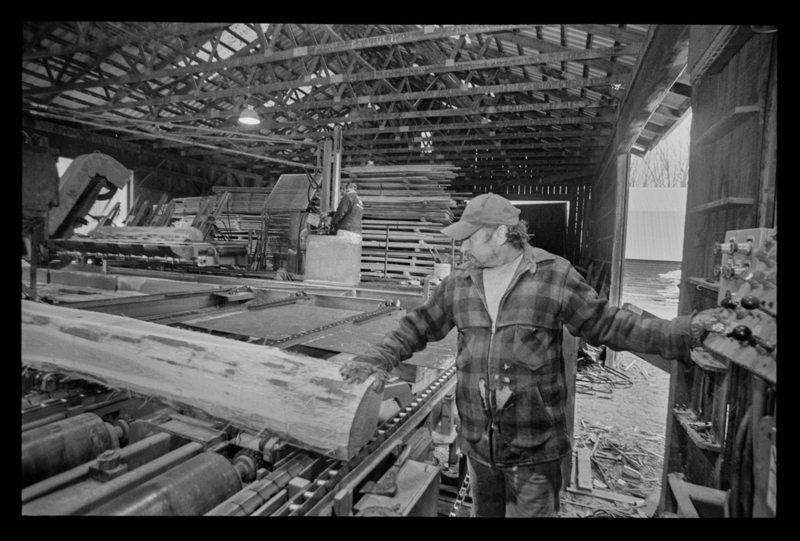 Detail photos from left to right, above: Exclusively Vermont uses only Vermont timber grown almost entirely within a 40-mile range of the mill; near right, Sam Hutchinson has sawn lumber for Tom Lathrop for years and instinctively understands how to slice the beams that Tom sends him; near left, computers can maximize yields but don’t detect defects like knots and lack the human eye to highlight the grain and character of each board; far left, Lathrop’s stocks 200 varieties of flooring in 15-plus wood species. Barry Burnham began helping his father in his home construction business during high school and joined him upon graduation in the early 1980s.Several years later, he set up his own shop to concentrate on cabinetry and fine furniture during slow spells. And in the late 1990s, he added a portable saw mill to cut timber for others and his own projects. Burnham only partly jokes that he has passed 50 and is still trying to figure out how to make a living in housing’s boom-bust cycles. “Whatever it is, it has always been about wood and where I can best spend my time. There have been times when the mill is real busy and building isn’t. Other times it has been just the opposite. “I’m still trying to figure out the best mix. For now, I’ll stick with diversification,” says Barry. Detail photos from right to left: The cut list is a sawyer’s blue print, left, in this case beams for a small sheep barn; center, good boards start with a level setup, a sharp blade, and a blade square to the cutting bed, and the fence square with the blade. Small errors quickly compound during the dozen-plus slices of a 20” log. The building trades are really iffy today. There are so many builders. It’s a saturated market so you have to be diversified to weather the ups and downs. That’s why I like running the mill. It’s easy. You take this raw material and turn it into valuable lumber. It’s just cool. But I don’t think there is enough demand year round to making a living at it. Detail photos from right to left: The crew: Rick Laporte, left, on dozer; center, Steve on chain saw; right, T.J. Turner on skidder; center, know your escape route, generally a 45-degree angle from the stump; left, the longer the skid, the less the profit. An hour was the turnaround time in the distant reaches of Weber’s wood lot. Mike Quinn refers to himself as an anomaly in today’s logging world where profit can be pennies on pieces and bigger is better. 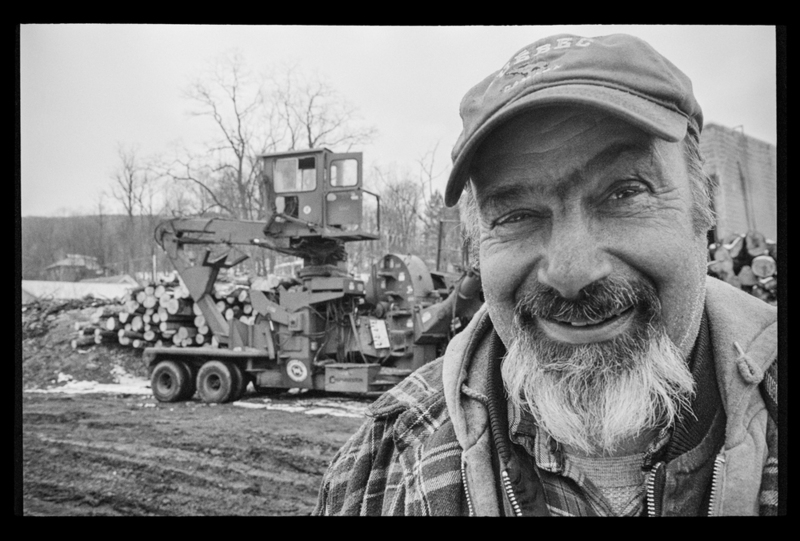 Quinn, a self-described wheeler-dealer, is a throwback to the jack-of-all trades logger-farmer of the past. Winters, he cuts timber on his and others' wood lots. Sugaring time, he tends his 1,000-tap sugar bush. 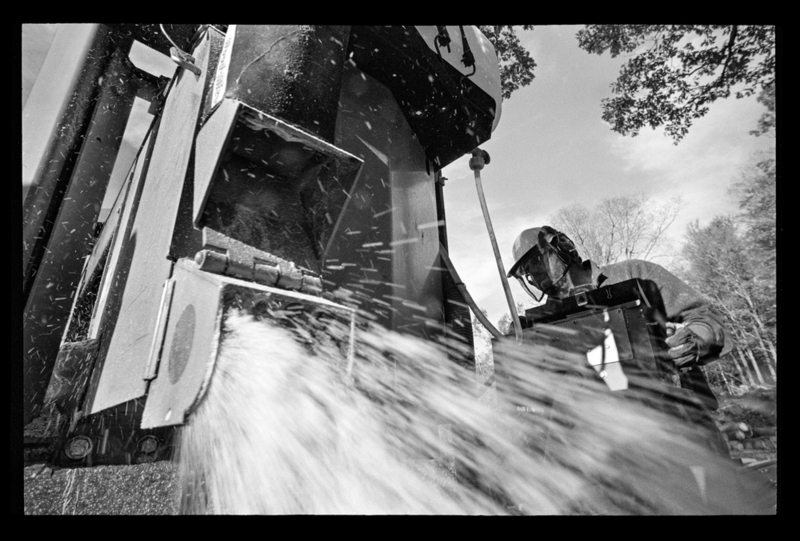 Summer is milling time at his backyard sawmill that was state-of-the-art 75 years ago. Summer and fall are haying time on his 200-acre East Middlebury farm. Raising heifers, 50 or so, is a year-round chore. “I’ll do anything where I can make a buck,” says Quinn of his patch-together-a-living lifestyle. Detail photos from left to right: Winter sequence - Nineteenth century loggers cut mainly in the easier skidding months of winter. Economics today requires loggers to work in the field year round, with the exception of mud season. 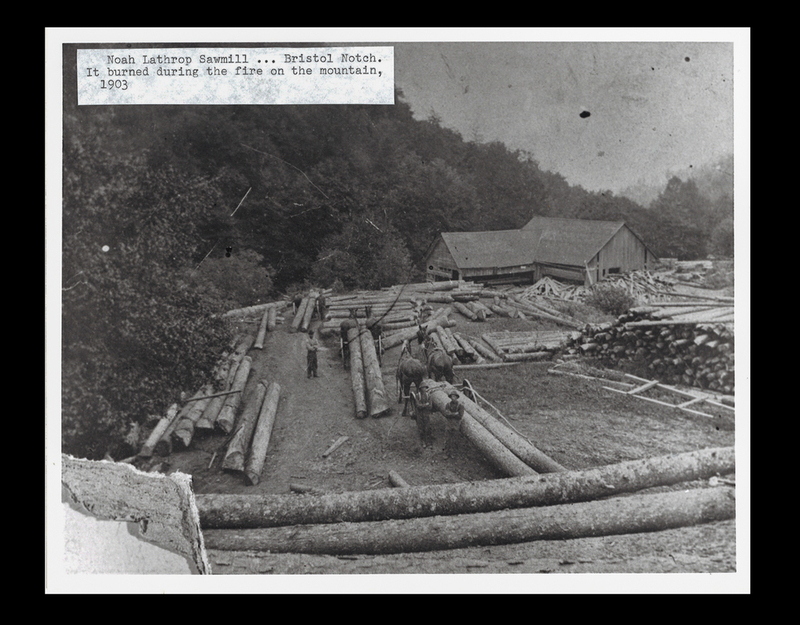 Sawmill sequence - Quinn’s many-hatted operation involves haying, logging, sawing, sugaring, and raising heifers all on his own land. Hemlock is a workingman’s lumber. Good enough for beams but not stable enough for higher-value cabinetry and furniture.